Revolutionary micronpump is 20 times thinner than a hair, delivers drugs to exact location in the brain. Many potentially efficient drugs have been created to treat neurological disorders, but they cannot be used in practice. Typically, for a condition such as epilepsy, it is essential to act at exactly the right time and location in the brain. 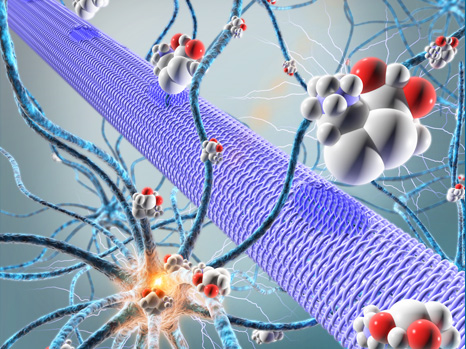 For this reason researchers from Inserm, École des Mines de Saint-Étienne and Linköping University have developed an organic electronic micronpump which, when combined with an anticonvulsant drug, enables localised inhibition of epileptic seizure in brain tissue in vitro. The study is published in the journal Advanced Materials. The team explain that drugs constitute the most widely used approach for treating brain disorders. However, many promising drugs failed during clinical testing for several reasons. This could be that they are diluted in potentially toxic solutions, they may themselves be toxic when they reach organs to which they were not initially directed or the blood-brain barrier, which separates the brain from the blood circulation, prevents most drugs from reaching their targets in the brain,and/or drugs that succeed in penetrating the brain will act in a non-specific manner, i.e. on healthy regions of the brain, altering their functions. Epilepsy is a typical example of a condition for which many drugs could not be commercialised because of their harmful effects, when they might have been effective for treating patients resistant to conventional treatments, state the team. During an epileptic seizure, the nerve cells in a specific area of the brain are suddenly activated in an excessive manner. The researchers wanted to know how can this phenomenon could be controlled without affecting healthy brain regions. To answer this question the team have developed a biocompatible micronpump that makes it possible to deliver therapeutic substances directly to the relevant areas of the brain. The micronpump is 20 times thinner than a hair and is composed of a membrane known as ‘cation exchange,’ i.e., it has negative ions attached to its surface. It thus attracts small positively charged molecules, whether these are ions or drugs. When an electrical current is applied to it, the flow of electrons generated projects the molecules of interest toward the target area. The team state that this technology may resolve all the above-mentioned problems associated with neurological pharmaceuticals by allowing very localised action, directly in the brain and without peripheral toxicity. By combining electrodes, such as those used to treat Parkinson’s disease, with the micronpump, the researchers foresee this technology being used to treat patients with epilepsy who are resistant to conventional treatments, and those for whom the side-effects are too great. Based on these initial results, the researchers are now working to move on to an in vivo animal model and the possibility of combining this high-technology system with the microchip they previously developed. The device could be embedded and autonomous. The chip would be used to detect the imminent occurrence of a seizure, in order to activate the pump to inject the drug at just the right moment. It may therefore be possible to control brain activity where and when it is needed. The team surmise that in addition to epilepsy, this state-of-the-art technology, combined with existing drugs, offers new opportunities for many brain diseases that remain difficult to treat at this time. The organic electronic micropump (represented by a purple cylinder) directly releases among the neurons, active molecules (spheres) that will control the activity of these neurons (here they will stop the epileptic activity). © Adam Williamson, Christophe Bernard, ID Labs, Arab4D (Christophe Bernard: Controlling Epileptiform Activity with Organic Electronic Ion Pumps. DOI: 10.1002/adma.201500482. 2015. Copyright Wiley-VCH Verlag GmbH & Co. KGaA. Reproduced with permission).